A living, breathing guide to testing React components. Constantly updated, better you bookmark it! I don't want to scare you but imagine this. "Ok, Gunnar here's your task. We are in the process of rebuilding the application. I want you to rewrite it from scratch. But I want you to follow a TDD approach. You should write a good testing suite for this project". TDD? Testing suite? Does this story sound familiar to you? At this point you might asking: why do we need to test our React components? Why do we need to test our applications at a glance? Everything is great until you play with React on your own. But as soon as you hit the real world you'll be in trouble. I'm focusing on React here but really, it could be any other library, or framework. As Jacob Kaplan-Moss said: "Code without tests is broken by design". I bet it is! I would also say: in a web application without tests your users will be the beta testers. Are you ok with that? Because I'm not. Would you trust un-tested code from other developers? I know you spent 6 months learning the basics of React and now you feel like you learned nothing. The problem is that most courses and tutorials don't give a **** about testing. If you learned the basics of React don't stop there. How to test React and Redux within a project? What are acceptance tests? 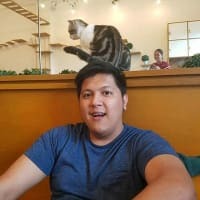 Do I know something about double-loop TDD? It could sound like propaganda but I guarantee it's not. There's no way to survive in the market without these skills. So here's a living, breathing guide to all things testing in React. If you have a basic understanding of React then this guide is for you. I suggest also taking some time for investigating the theory around testing frameworks and Test-Driven development. In this guide I assume you know what Jest is and what a testing framework does. Testing React Components: let's take a snapshot! One of the simplest way for testing React components is snapshot testing. Snapshots are a common theme in technology: you can take a snapshot of a virtual private server. Or you can take a snapshot of a volume in AWS. And so on. Snapshot testing in React is not built into the library itself. This snapshot thing comes in fact from Jest: snapshot testing is a feature built into Jest. So, how does the snapshot testing work? Jest (the testing runner) takes a snapshot of the component on the first run, then it checks if the saved snapshot matches the actual component. How does a snapshot test looks like? For snapshot testing a React component you can create a new file in a folder called __tests__, inside your project's src folder. Jest will look there for new tests to run. Then in the test file you should import React, react-test-renderer, and the component you want to test. But let's break down things a little bit. Guess what, it is a good way for testing our components in the most simple way. And what is create? create is a method from react-test-renderer for "mounting" the component. Well, the component does not get mounted like you could expect. Instead, create creates an instance of the component, which you can make assertions on. It is worth nothing that react-test-renderer does not use the real DOM. Moving further into our test there is toMatchSnapshot which is a method provided by Jest. At this point one of the most frequent question is: how to choose between snapshot testing and other types of testing in React? I have one rule of thumb: does your component changes often? If so, avoid snapshot testing. If you take a snapshot of a component the test passes. But what happens when you modify the component? As you may guess snapshot tests are good for component that doesn't change often. Put it another way: consider writing a snapshot test when you're sure the component is stabilized. And now let's take a closer look at react-test-renderer! But it seems that react-test-renderer can do a lot more than creating objects. In fact we can use react-test-renderer for asserting the behaviour of our components. Let's say we want to create a button component. The button should change its text from "SUBSCRIBE TO BASIC" to "PROCEED TO CHECKOUT" when clicked. Since we're doing Test-Driven development the discipline imposes you to write a failing test before doing anything else. It appears the component has some minimal logic into it. It could have a state too. That means a snapshot test would not be our best choice. We want to test methods and logic for our component. How would you go about that? Turns out react-test-renderer can help us testing these kind of components. Let's see how into the next section! We need a button component for our application. As you can see I labeled the test as "testing the wrong way". Since we're testing a stateful component (a React component with its own state) we are naturally tempted to test the internal implementation of it. We'll create an instance of the component with create. Next we'll get that instance for asserting on its internal state. If I run the test with npm test it will fail because I haven't created the component yet. Now if I run the test again it passes. Up until this point I haven't tested everything yet: how about handleClick? 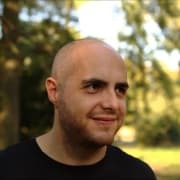 How can I test internal methods on my React components? Turns out we can call methods on our instance! If I run the test again it still passes. But can you see the trap in this test? Are we testing the component from the user's point of view? I have no clue whether my button will display the correct text to my users. Is there a way to test that? Testing the internal implementation of an object is always a bad idea. What we can do instead is testing the component from the user's point of view. For example in the double-loop TDD the development is driven by a functional test. A functional test, or End to End test is a way of testing web applications from the user’s perspective. (Functional test, End to End test, call it whatever you want, really. There is confusion and overlap in testing terminology. I suggest doing some research on your own for learning more about the various types of testing). For functional testing I tend to use Cypress a lot. But for now we can obtain the same result at the unit level with react-test-renderer. Let's see how to refactor our test. We tested the internal implementation of the component, calling handleClick directly. And we didn't test what the user should see. According to the documentation testRenderer.root "returns the root test instance object that is useful for making assertions about specific nodes in the tree". Let's find our button then! Granted, we could also simulate the click event with Enzyme. But for now we're good: we finally tested what the user should see and not the internal component's state like we did before. Remember: when testing a stateful component (a React component with its own state) you may be tempted to test its internal state. You may want to take another path: testing the output of the component. Do not test the implementation: test the component from the user's perspective. In other words: test what the user should see. Fetching and displaying data is one of the most common use cases for a front-end library. This is usually done by contacting an external API which holds some JSON for us. In React you will use the componentDidMount lifecycle method for making an AJAX call as soon the component mounts. You can also use async/await for componentDidMount (even though there are some caveats). Now, the thing is: how do you test an AJAX call within React? Should you make a call to the actual API? Maybe! But some questions arise. Consider this: your team runs automated testing in a CI/CD environment. The team commits to the main branch 3/4 times a day. What happens if the API goes down? The tests will fail with no reason at all. And what happens if every call to the API costs money? Clearly, contacting the real API during testing is far from optimal. We can use fakes and mocks. Faking external requirements is a common pattern in testing. For example we can replace an external system with a fake during the testing phase. Since the advent of modern testing frameworks we can even mock functions. Mocking is the act of replacing an actual function with a fake copy. For learning more about mocks and stubs check out TestDouble by Gerard Meszaros. For now we'll focus on mocking GET requests in Axios. Axios is one of the most popular library for making AJAX requests and with Jest you can mock its functionalities. Let's see how to mock .get, which is an axios method for making GET requests. Again, let's start with a test. Suppose we want a Users component for fetching and displaying a list of users. A naive implementation could use async/await in componentDidMount (although it's a bad idea). That means when laying down our test we can await on componentDidMount. You should be already familiar with create and getInstance from react-test-renderer. Notice also how you can use async/await in Jest. You probably saw something similar in a previous post of mine, when I covered testing Koa with Jest and Supertest. Also worth noting in the above example: I'm calling componentDidMount on the testing instance. Now if I run npm test the above test fails because I haven't created the component yet. Better we make a minimal implementation for it! I couldn't resist using async/await on componentDidMount but let's be clear: it is bad practice. You should always move asynchronous logic out of React components. Anyway for this example it's ok, we won't do any harm. I must confess I can't resist to console.log too. Are you ok if I snitch inside the state of my testing instance? console.log(instance.state) // << HERE IS THE SNITCH! Surprise! After running instance.componentDidMount() I can see the new state being updated! 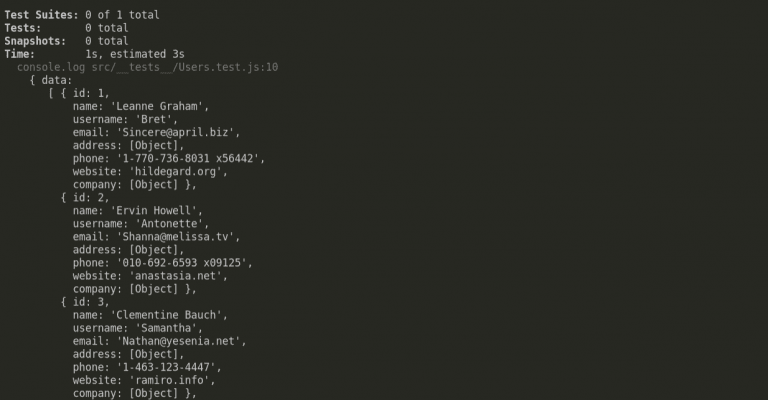 There's also what appears to be some JSON coming from jsonplaceholder.typicode.com. We called the real API! You would never, ever call a real API during a test. If the API slow down your automated tests will suffer and break. If the API goes down your tests will break too. If the API is paid you'll be charged every time you run npm test. That's why, let me repeat again, you would never, ever call a real API during a test. console.log(instance.state); // << HERE IS THE SNITCH! We succeded in mocking axios! Now we can complete our test with some assertions (and remove console.log). We want to test that our users effectively see 2 li elements from this React component. If you remember, when testing React components we shouldn't care about the internal state. We're interested in testing what the user should see. Notice the use of component.root and findAll called on the root instance. Now the test passes! Fantastic. What's the takeaway from this section? You would never, ever call a real API during automated testing. The API could go down and your tests will fail. By mocking axios and providing a fake response we ensure test isolation: tests should not depend on external systems. In conclusion: next time you're testing API calls don't forget jest.mock! The cool part is the way you write the unit tests can also be done writing the Cypress or functional tests! This looks to be a great outline to help jump into TDD while creating a solid understanding, and could certainly become the go-to for beginners! Unfortunately, it's really hard to read when every sentence is on a separate line causing ideas to flow together. Clean up the formatting a bit and this is sure to become a go-to resource for many looking to learn about TDD! There are developers out there like me who struggles to step up his/her game.